$85,000 Easter purchase Mossfun joined an illustrious honour roll of Inglis graduates when winning the time-honoured Group 1 ATC Golden Slipper Stakes at Rosehill on Saturday. Mossfun (Mossman x Eye For Fun) becomes the 21st Inglis graduate to win the world’s richest two-year-old race joining the likes of fellow Inglis fillies Magic Night, Reisling, Bint Marscay, Merlene, Miss Finland and Forensics. “It is hard to get a two-year-old let alone a filly like this. She was bought for $85,000. We’re pretty excited and jubilant at the moment but I still don’t think it has really sunk in yet,” said Michael Hawkes, who trains the filly with father John and brother Wayne. All the connections of Mossfun were left stunned when the outstanding juvenile missed the start in the $3.5 million feature, but jockey James McDonald didn’t panic. Mossfun crept up along the fence and although most of the day's other race winners had come down the middle of the Rosehill straight McDonald kept to the rail and Mossfun dashed away to an emphatic victory over Earthquake and Bring Me The Maid. "When the gates opened I just couldn't believe it. I was in shock, but then thought about Hawkes’ instructions 'Just don't panic, sit back and do your thing and let her do the rest,' and that's what she did. She's a super two-year-old,” said McDonald. Bred by Dr Ian Duckworth, Mossfun was knocked down to the bid of Trevor Lobb on behalf of Emirates Park for $85,000 when the filly was offered as Lot 556 from the draft of Fairview Park Stud in Session Two at the 2013 Inglis Australian Easter Yearling Sale last April. Mossfun races in the colours of Hussain Lootah, the son of Emirates Park’s owner His Excellency Nasser Lootah. “We could not be happier. Nasser and his son Hussain have put a lot of money into the Australian industry and it’s great for them to be here today to collect the Golden Slipper trophy,” said Lobb. The Slipper winner won the $250,000 RL Inglis Nursery on debut last December before taking the Gr.3 ATC Widden Stakes and Gr.2 ATC Sliver Slipper on her way to today’s race. 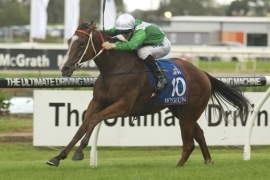 The daughter of Mossman has earned $2,500,500 from four wins and a second in five starts. Mossfun, an $85,000 buy from Session Two, is proof that first class quality is available from throughout the buying spectrum at the Inglis Australian Easter Yearling Sale. Underlining their versatility other major Group 1 races won by Inglis graduates this season include the Caulfield Cup, WS Cox Plate, Victoria Derby, Australian Guineas and last week’s Dubai double of the Al Quoz Sprint and Golden Shaheen. 555 yearlings have been catalogued for this year’s Easter Sale including Mossfun’s half-brother which will be offered in Session Two as Lot 523 by Fairview Park Stud – the vendors of the Golden Slipper winner. The 2014 Easter Sale begins at 1:00pm on Tuesday 8 April. Don’t miss it!